Just as a head’s up – unfortunately, my posting here is about to slow down considerably. I, apparently, have a great deal of work to catch up on. And I was hoping, if things worked out well, I’d have some good internet time in the next few months .. but that appears to be unlikely now. I’ll try to keep posting here as possible, it’ll be a little slower for a while, I think. Bummer, eh? 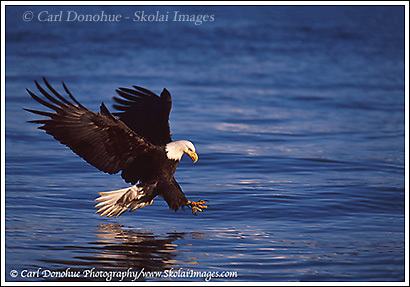 In moving along with my ‘showing some older, pre-blog-photo-era images, I thought I’d post a bald eagle image. This is from the winter of 2002. Anyone who’s shot at Jean Keene’s down in Homer in the winter knows what a blast it is to photograph the bald eagles there. This particular afternoon was one of the most exciting of my life, with the light and the bald eagles and the wind all working in my favor. An amazing experience. I need to thank my friend Mark (from Washington DeCeive, the nation’s capital) for this image – he was throwing frozen herring into the bay for the bald eagles, and I was able to get him to time and place the bait perfectly. I think I went threw a roll of film in about 2 minutes. This particular week was one of the most memorable photo trips I’ve had – we had great light, great company, and great photography all weeklong – great time! This entry was posted in Alaska, Birds, Wildlife on October 15, 2008 by Carl D.
Oh Carl, what an awesome pic!You have that eagles’ intentions dead on. And the reflective part in the water is great!! !What a wonderful pic of wildlife!